Time for Stop 23 & Chapter 23 of the CONSEQUENCES audioBOOK blogTOUR! If you’re in a hurry to listen to Chapter 23: GUILT IN A TEA CUP, hurry over to SULTRY SIRENS RIGHT NOW! Me: Run run to SULTRY SIRENS to find out! Got a few minutes? Good. Let me introduce you to the Sultry Sirens Book Blog—aka book-loving friends Liz and Kim who share a passion for all things romance. But let’s give the floor to the Sirens for a few minutes, ok? I am a bookaholic who never has her Kindle app (on her iPad and iPhone) far from me. I will sneak in some reading anywhere I can. And I mean anywhere! I have been reading since as far back as I can remember. I have fond memories of walking to the local library and coming back with stacks of books, only to go back a few days later to get more. I love all kind of genres, from mystery, to suspense, to horror to romance, but in recent years I have discovered this new world of indie authors and books that are truly amazing. Authors who interact daily with their readers. Fellow readers that have become friends, but that I have only met online. It was a world made for a lover of reading such as myself. I read all kind of romance books. From very dark reads, to rom-coms to angst-filled, rip your heart out reads and anything in between. My love for reading started when I was in the 2nd grade. My teacher would read Little House on the Prairie to the class during our lunch period. Every day, I would go home and ask my mom to let me buy the entire series so I could read along with the teacher. My summers were spent at the library where I would check out as many books as I could and spend every day reading. Then life happened. I put away my beloved Babysitter’s Club, Sweet Valley High and Judy Blume books. I married my own personal book boyfriend and spent my time raising our two beautiful children. In 2014, I decided to jump on the bandwagon, although a little late, and read The Twilight Series. From there, Fifty Shades happened…and I’m sure you can guess the rest! I love a good rom-com and when the mood strikes, a good angst-filled story with a dash of hope. I adore this book community, the authors who engage with their fans, the blogs that support those authors and the people who have become supportive friends, without ever meeting. This book community of ours is an amazing one, and I am glad to be a part of it! 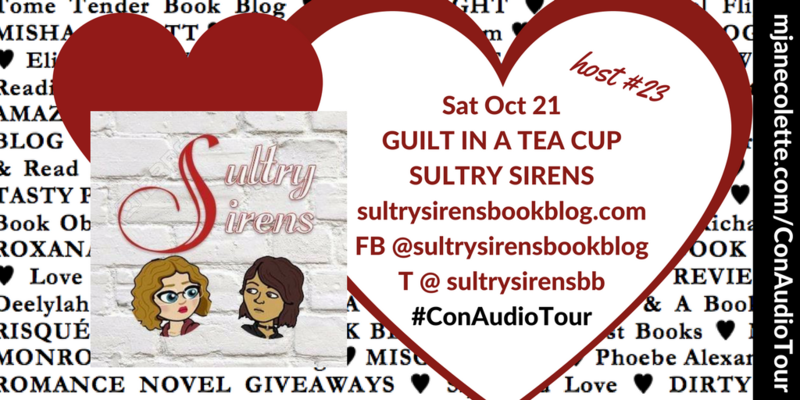 I am so thrilled the Sultry Sirens accepted my invitations to be part of the Consequences Audio Tour, and I hope their readers enjoy the “Guilt In a Green Tea Cup” chapter, which is all about metaphors. Thank you, Liz, Kim and SULTRY SIRENS BOOK BLOG!